Born in 1937, at Brighton Hospital in Boston, Massachusetts, Walter was the only child of Walter McCann, Senior, and Lillian Provost. He grew up with loving parents and with Rosie, his doting French-Canadian grandmother, who sowed the seeds of love for the French language that would have a deep impact for the rest of his life. He grew up in Newton, Massachusetts, and completed high school while living at a lovely cottage by the sea in Plymouth. At this time, Walter pursued serious study of French, his early passion, and began yearly trips to France with his colorful French tutor. While in Plymouth, he joined the school baseball team, an experience that inspired a life-long love of the game. Walter´s high school baseball team. Pitching at an Athens College game. At Wesleyan University, class of 1959, Walter majored in Government and graduated Phi Beta Kappa with the Davenport Prize. After Wesleyan, he spent a year on a Fulbright scholarship at the University of Louvain in Belgium. Walter returned to the U.S. to enter Harvard Law School. He graduated from Harvard in 1963 and was admitted to the Bar in Massachusetts and Washington, D.C. Like many young lawyers from Massachusetts,, he headed to Washington. Soon he was hired as Legislative Assistant to Congressman John Brademas, drafting educational legislation. In 1967 Walter became a member of the faculty of Harvard Graduate School of Education where he taught courses on the legal aspects of education and served as a department chairman. He was thesis advisor to many doctoral candidates. After 12 years at Harvard he was appointed Dean of the Barney School of Business at the University of Hartford in Connecticut. While at Hartford, he met and married his wife, Dr. Alba Ambert. She brought to his life a daughter from her first marriage, Yanira, who has been a caring and loving presence in his life. During his years at Harvard, Walter developed a passion for sailing. He took sailing lessons at the Charles River and eventually purchased a 32-foot sailboat, named The First Puff by her original owner. His love of sailing brought him to the azure Caribbean, the wine dark Aegean, the sparkling Cote d’Azur, among many others. In an unusual way to move to a new job, having sold The First Puff, he met up with a friend in New England and sailed from the Dalmatian Coast to Corinth, wending his way by land to Athens where he had accepted the position of President of Athens, the American College in Greece. He liked to say that he was the only President of the College to arrive by boat. Seven “tumultuous” years, as he called them, in Athens, were punctuated by attempts to nationalize the school, endless strikes and terrorist attacks, some of which killed friends and colleagues. The Greek adventure, though challenging, brought many joys to his life that included life-long friends, sailing adventures and a broadened aesthetic sense. Walter on The First Puff. When offered the presidency of Richmond, The American University in London, Walter and Alba were ready for a different European city. The decade they stayed in London offered them a vision of a possible world. For Richmond, with students and faculty from all over the world, was the embodiment of different races, cultures, linguistic and religious groups, living and studying together in peaceful coexistence. Richmond had campuses in Italy and Japan that offered more opportunities for travel and adventure. While in London, Walter was invited to Kazakhstan to receive an honorary doctorate from Gumilyov Eurasian University, in Astana, in recognition of his educational work there. At the age of 65 Walter retired. He was awarded an Honorary Doctorate in Law from Richmond. In August of 2002, he and Alba returned to the United States to start a new life in a part of the country new to them and they both found that Chapel Hill, North Carolina, was a delightful place to live. Celebrating Walter´s birthday in London. 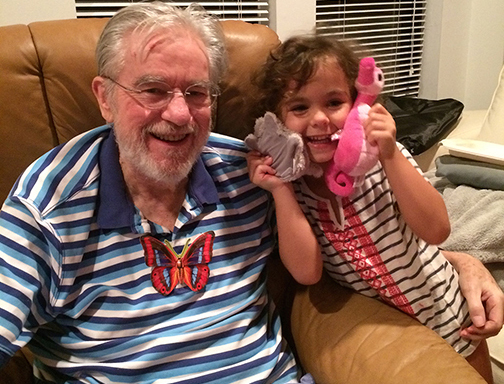 A few years ago, Walter wrote the following for inclusion in the Wesleyan Bulletin: “I must mention that my wife, Dr. Alba Ambert, and my daughter, Yanira Ambert de Posson, have made the difference between just being alive and living a full life.” In January 28, 2011, Walter’s granddaughter, Micaela, was born. He called her “mon petit hibou” and they enjoyed a close and loving relationship. Micaela, Yanira and Alba were with him, holding his hand, as he journeyed into the Light. Walter´s professional and personal accomplishments were outstanding. But he will mostly be remembered as an honorable, noble, kind, witty, patient, loving and truly caring human being who touched deeply the hearts of many. A light has gone out in the world. Walter believed that the work of the American Civil Liberties Union was now more important than ever and he supported their efforts. Instead of flowers or gifts, we invite you to make a donation to the ACLU in Walter's memory. Thank you for your loving wishes and for supporting this important organization. The link below will direct you to the ACLU. We invite you to share your memories of Walter. Please go to the menu above and click on Share. Once in the page, click on Comments. Thank you.